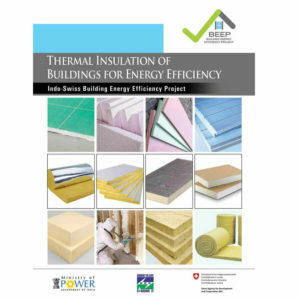 Building insulation helps reduce heat transfer through the building envelope. In hot climates, insulation on roofs and walls reduces the transfer of heat from outside to inside spaces. In cold climates, insulation prevents heat transfer from the warmer inside spaces to outside. Application of insulation materials in buildings is showing an increasing trend. However, there are several barriers that are impeding its large-scale adoption. BEEP has been contributing to overcome some of the barriers. One of the issues is related with the knowledge and skills needed for proper selection and application of insulation materials. 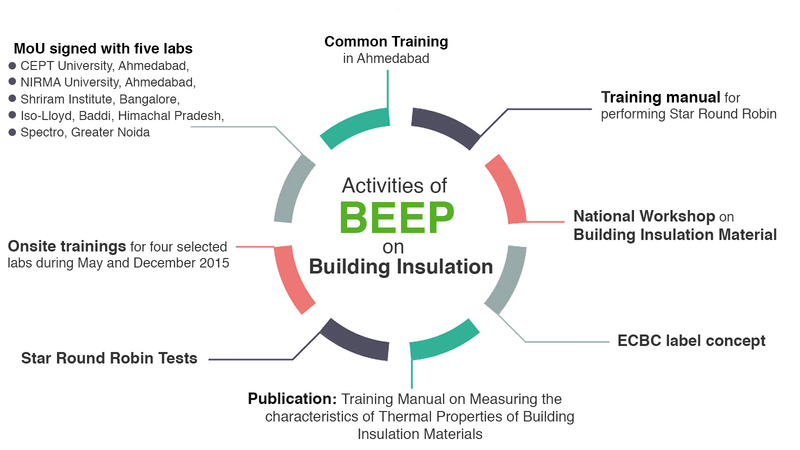 BEEP has come out with a publication, Booklet on Thermal Insulation , and organized training programmes on selection and application of insulation materials. 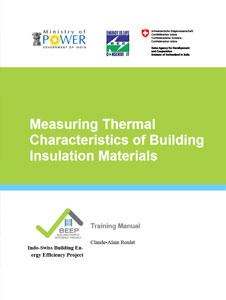 Another area is developing the capacities of Indian laboratories to test insulation materials. In 2015, BEEP signed an MoU with four partner labs for the development of the physical infrastructure and human competencies in selected Indian laboratories for testing of building insulation materials in India. The technical support to the selected labs under BEEP was tailor-made as per the needs of individual labs. Since 2014, a strong working partnership has been established with the India Insulation Forum (IIF), an association of insulation material producers, who also assisted in sourcing material for the Star Robin Testing as well as in conducting awareness and training activities. BEEP has also been promoting the use of insulation materials in its charrette projects. In several charrette buildings, both roof insulation and wall insulation have been used (e.g., Aranya Bhawan).